If money, children, jobs, mortgages, you get the idea, wasn’t an issue. What would be on your ultimate bucket list? Think of at least 10 and tag your friends. Add the badge and link up back here. 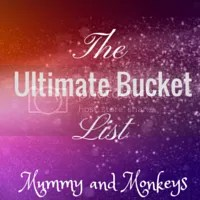 I’m going to do an Ultimate Travel Bucket List next! "Camp Smokey Bluestone Wales – video"
"Birth story #9 TTTS birth story"
Great bucket list. I would love to own my own home. Currently renting and it kills me paying someone else’s mortgage. Hope you achieve everything on your list. What a super list! We often have the fantasy, ‘if we won the lotto’ chat, I veer on the sensible side with it, I do hope if it were to ever happen I’d be a little bit wreckless too lol! !